WASHINGTON — Starting and running a small business is challenging enough, especially right now, with the economic recovery still struggling to find its footing. It can be all the more difficult if you're female. A new congressional report found that women own nearly a third of the country's small businesses, yet they account for less than 5 percent of the money borrowed through traditional small-business loans. Some of that, the researchers note, is probably because the types of companies commonly run by female entrepreneurs — think small retail operations and other consumer-facing businesses — require less funding to get off the ground. Consequently, a disproportionately large number of female entrepreneurs seek what are often considered "microloans," which generally fall between $5,000 and $50,000. But the report, released last week by the Senate Small Business and Entrepreneurship Committee, notes that the gap in dollars awarded cannot be entirely attributed to the size of loans women are seeking. Rather, researchers found that female business owners are more often turned down for loans than their male counterparts, and those who do manage to secure capital generally do so under much less favorable terms. "Women entrepreneurs still face a glass ceiling," the authors of the Senate report wrote. It isn't just in the lending arena that female entrepreneurs are facing a gender gap. Despite programs intended to direct government work to women-owned firms, many more federal contracts still go to companies owned by men, according to the Senate committee study. Moreover, women receive only a small fraction of venture-capital dollars. Any attempts to close those divides likely would start with the private sector and the financial industry. Still, some say federal lawmakers could take some steps to accelerate that process and give female entrepreneurs a greater shot at success. During a Senate hearing last week, several female business leaders and policymakers pitched their recommendations. Here are a few of their ideas. _Barbara Corcoran, founder of the Corcoran Group in New York and shark investor on ABC's "Shark Tank," said too few entrepreneurs are aware of the resources offered by the Small Business Administration (SBA). She thinks the agency is missing out on strategic partnership opportunities that could help drive referrals to its lending and counseling services. Specifically, Corcoran advised the agency to team with the growing number of online crowd funding platforms and business incubator programs across the county to help get the word out about its programs. "We need to take what's working and build a better communication system around it," she said during the hearing. _Veronica Davis, partner and principal planning manager of the business consultancy Nspiregreen LLC in Washington, suggested that the SBA ease restrictions on its micro loan program — an initiative popular with women-owned firms, under which the SBA provides loan funds through third-party nonprofits. She said the current effort includes too many rules that preclude those nonprofits from tailoring their offerings to best meet the needs of the borrower. _Lynn Sutton, chief executive of Advantage Building Contractors in Atlanta, noted that her company broke into the government services arena thanks largely to a roofing contract it was awarded under what's known as sole sourcing. The term refers to contracts negotiated directly between an agency and a private company, thus bypassing the conventional bidding process. "We did such a good job that the agency came back and said, 'Can you do this, can you do that?' " she said. "It allowed us to win more jobs before we even completed the first one." Sutton asked lawmakers to consider legislation that would allow sole-source contracts to be awarded as part of an existing female-owned small-business procurement program, which she says would give more women a chance to break into the market. 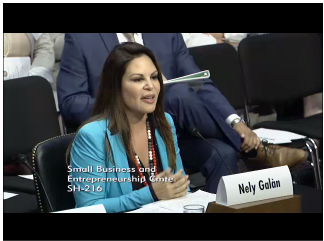 _ Nely Galán, founder of Galán Entertainment in Marina del Rey, Calif., and former president of Telemundo, urged the policymakers to take steps to better educate the public about the government's training services as well as its contracting opportunities. "If you go on the websites, and you're trying to start from scratch, it's very complicated," she said. Galán said the government could start by creating additional mentorship programs that connect up-and-coming female entrepreneurs with "women who are already further along." Sen. Maria Cantwell, D-Wash., chair of the committee, noted in an interview after the hearing that many women often are looking for more capital than they can put on credit cards but less than the $300,000-and-up loans available through the SBA's most popular lending programs. "They need that intermediate step," she said. She said the committee may consider legislation that would expand the SBA's lending offerings to try to address the gap in the $50,000-to-$300,000 range. Meanwhile, her staff is also working on a proposal that would make permanent a federal export assistance program, which she says would help small businesses owned by men and women expand their companies overseas.